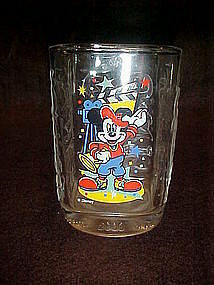 Celebrating the millenium, Walt Disney glass featuring Mickey Mouse as a director for Disney Studios. On the other three sides are embossing of Walt Disney World, Disney Studios and Hollywood and vine. Square clear glass measures 4 5/8" tall and is perfect. Picture of Mickey is bright and crisp. No damages. I have 3 different ones to this collection I will be listing also.